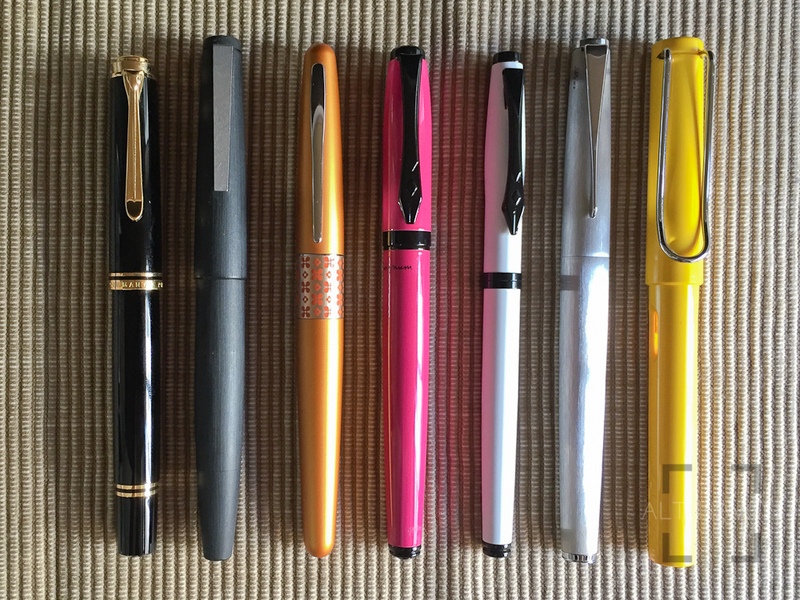 My thanks to YJ Brothers for offering the pens for review. 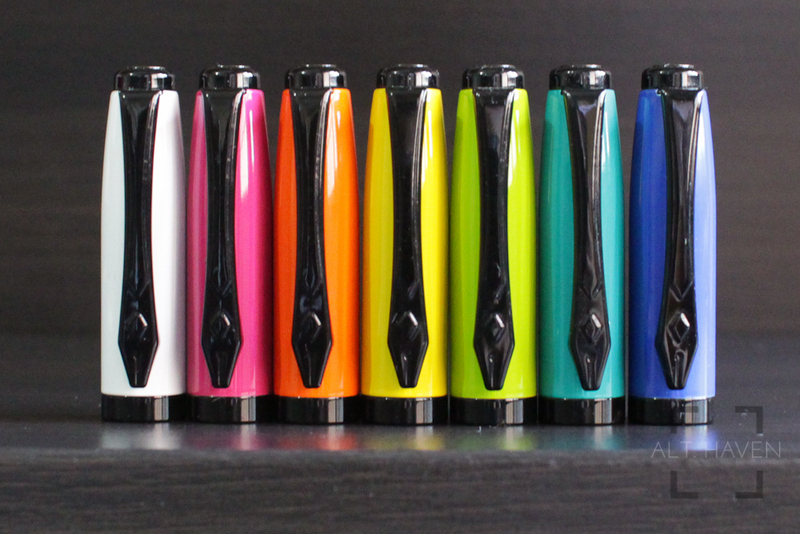 I will be giving away the pen at the end of this review, read to the end for more details. 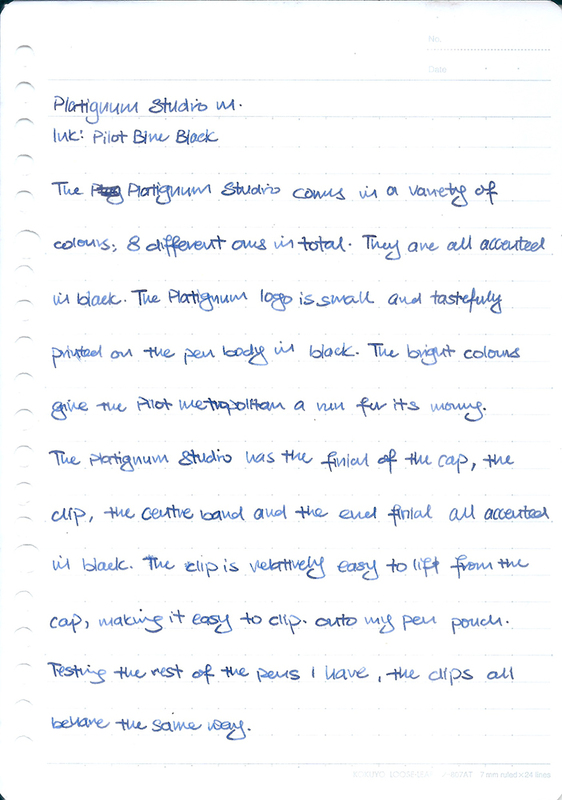 This is part 2 of my Platignum fountain pens review. Today I am reviewing the Platignum Studio. 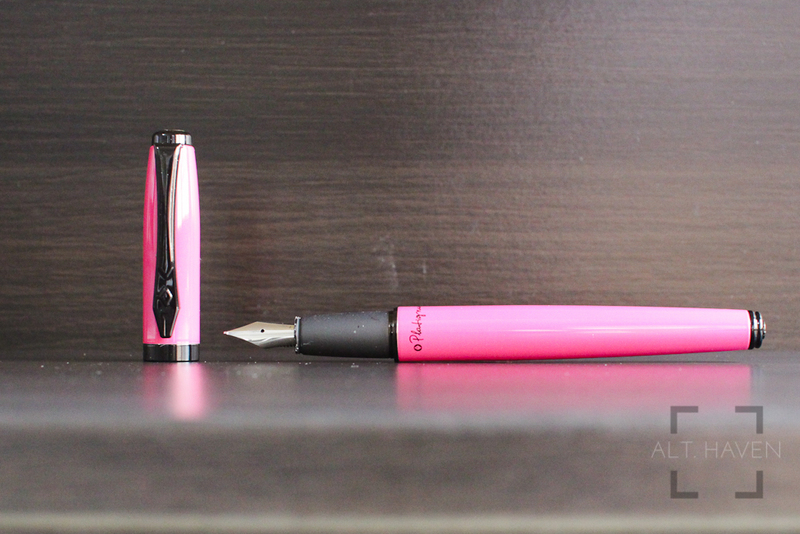 This is a full size fountain pen unlike the Vibe which is a slim fountain pen. The Studio is the elder sibling to the Vibe. Sharing the same parents, they are similar in some aspects. The Studio is only available in fine and medium nibs. The nib comes unstamped or stamped with “London 1919” according to the nib size. It’s a cartridge converter fountain pen. However like any real life siblings, they each have their own personalities. In terms of look and feel, the Studio is rather different from the Vibe. The Platignum Studio comes in a variety of colours, 8 different ones in total. They are all accented in black. The Platignum logo is small and tastefully printed on the pen body in black. 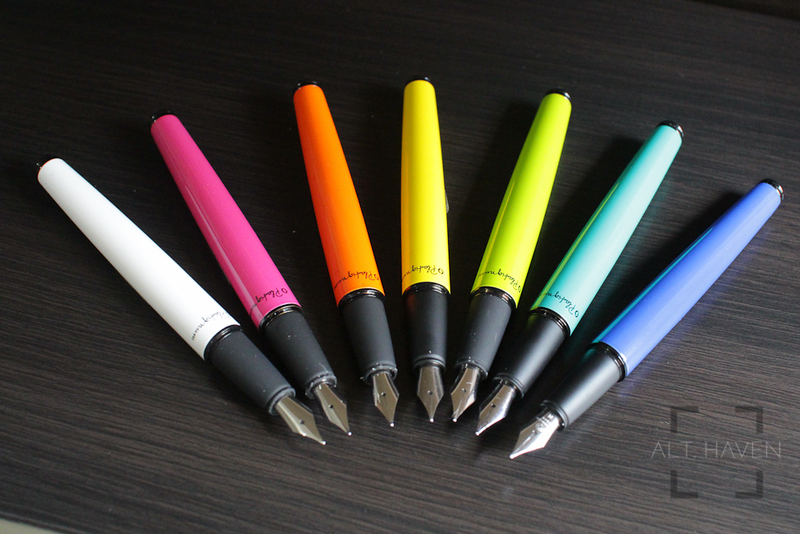 The bright colours give the Pilot Metropolitan a run for its money. The Platignum Studio has the finial of the cap, the clip, the centre band and the end finial all accented in black. 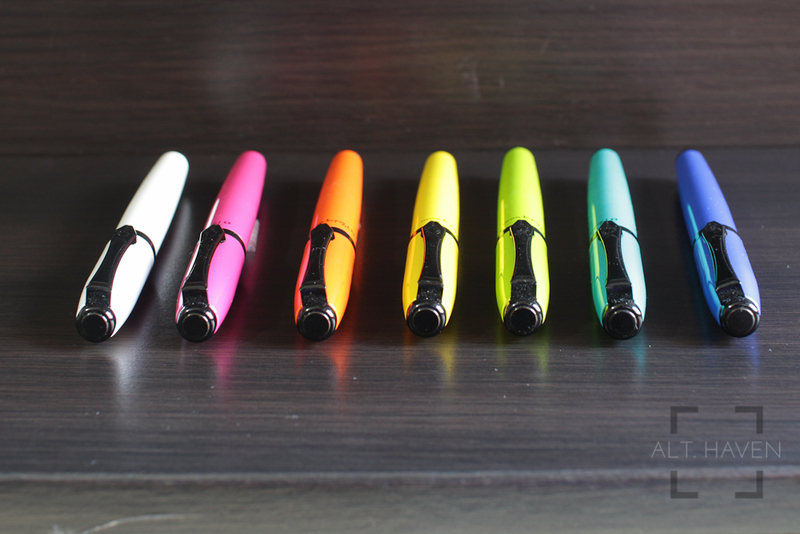 The clip is relatively easy to lift from the cap, making it easy to clip onto my pen pouch. Testing the rest of the pens I have, the clips all behave the same way. The QC might be better for the studio or the tight clip I encountered on the Vibe could be a one-off discrepancy. The cap pops on and off with an audible and satisfying click. Unlike the Vibe’s cap, the Studio’s cap can be posted at the end of barrel at any entry point. Just make sure you hear the cap click in place to ensure the cap is posted securely at the end of the barrel. The cap does spin around the barrel when capped. 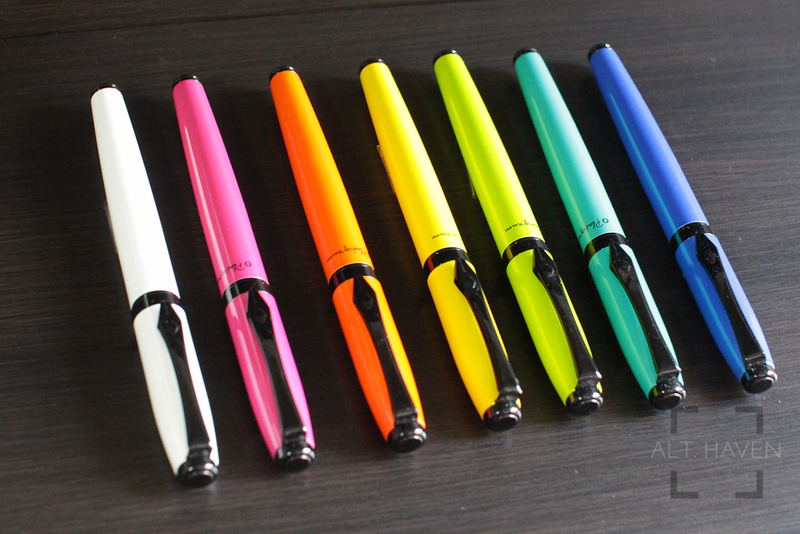 The different pens have different tensions on the ease of cap spin. I suspect the tensions get looser the most the pen is used but I can’t really confirm that. Just keep that in mind, if something like that bothers you. The Platignum Studio is made of aluminium, it isn’t very heavy but it has a nice weight in the hand. The pen is balanced even after posting the cap. The grip section unlike the Vibe is rubberised. 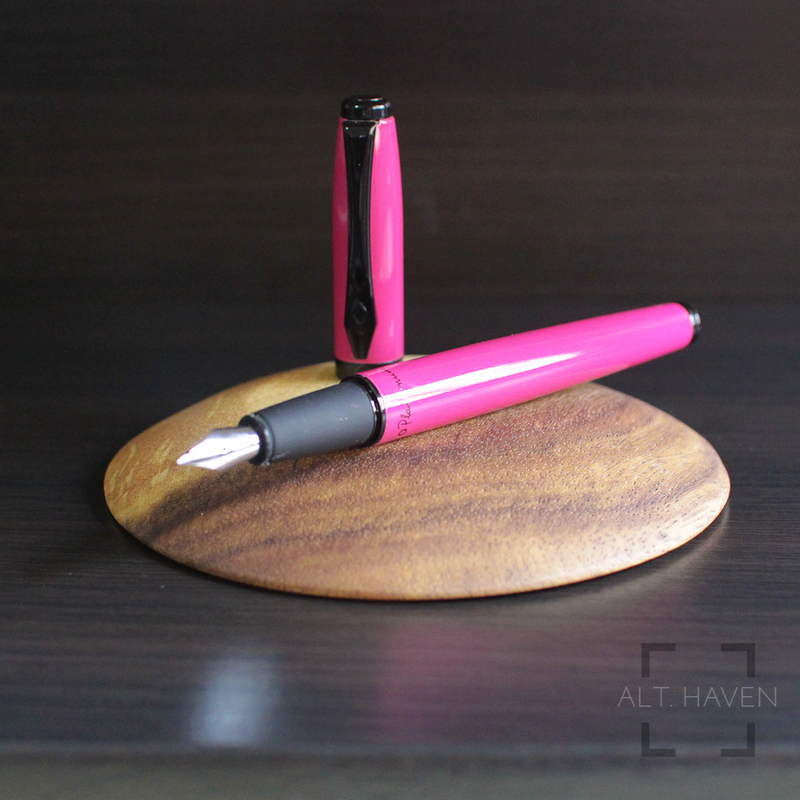 The rubberised grip ensures I keep a handle on the pen at all times. 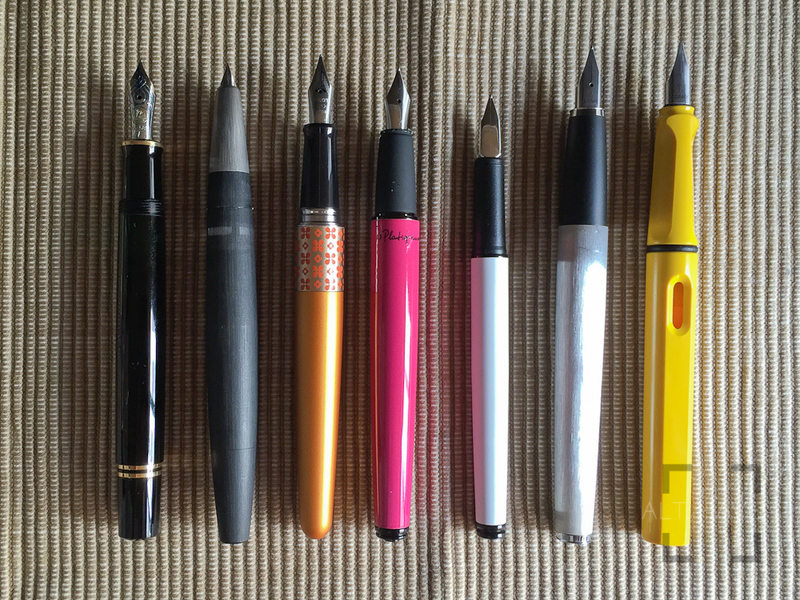 The grip taper narrower as it ends at the nib. I would if the grip would widen as it reaches the nib, making it sort of a stopper for your fingers from sliding too far. The rubberised grip might get worn from regular usage from wear and tear. This is evident when I compare the grip between the different Platignum Studio I have. However the wear isn’t too bad. It mostly gets worn only at the small lip at the edge of the grip near the nib’s end. Unscrewing the barrel, you will find the cartridge and converter system that Platignum uses. What I have previously wrote about the system on the Platignum Vibe’s review still applies for the Studio. Both the cartridge and converter look standard international sized but the pen didn’t work with my other standard international cartridges and converters from Faber-Castell or Pelikan. After a quick check with the distributor, I was told “Platignum Pens follows the Asian International Standard compared to the Western International Standard.” There is a difference of 1mm between the two standards. It would be easier to think of Platignum’s cartridge and converter as proprietary than not. 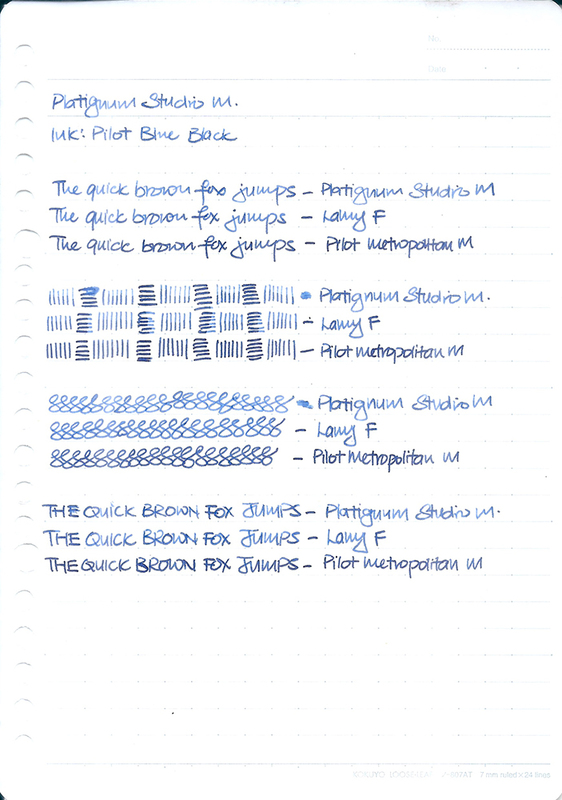 The Platignum Studio’s nib has a moderate level of wetness. It isn’t as wet as the Vibe’s. It also writes with the tiniest hint of feedback but it’s nothing that a little smoothing doesn’t fix. (No, it didn’t smooth the nib out. The pen doesn’t belong to me after all) The feedback wasn’t unpleasant and the drier nib works well for me (a lefty) Given a choice, I much rather go for the nib on the Studio than the Vibe. The Platignum Studio is a level up from the Vibe. 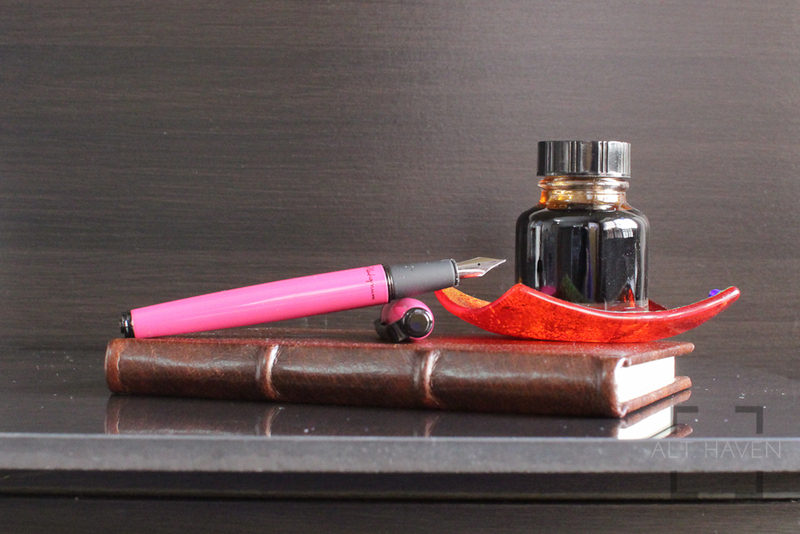 The full sized fountain pen is easier and more comfortable to hold and use for long writing session. The grip does help to keep the grip onto the pen more securely. I only had one nitpick regarding the way the cap spins even when capped. Other than that, the Platignum Studio is well worth the $28 it costs. 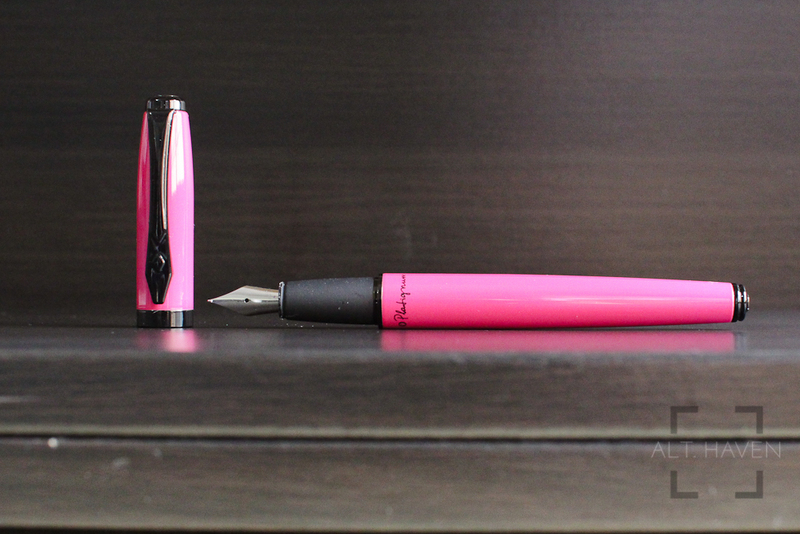 My thanks again to YJ Brothers for allowing me to give away the pink Platignum Studio you see in the review. It will come with a cartridge. All you have to do is to leave a comment. The giveaway will end 17th March 11.59pm and I will announce the winner the following day. The winner will have one week to claim the prize. The giveaway is open only to people residing in Singapore.